Rev up your DVRs! The games are scheduled on both ESPN Classic and ESPNU. Could this be an indication that the ESPN Classic channel is nearing its end? 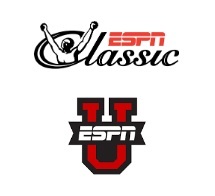 The ESPN Classic channel is SD-only, but ESPNU has both an SD and HD channel, not that games from the SD era will be in HD, but those from the HD era will. Note, however, that these replays occasionally skip minutes of play (with no mention of it). It was particularly disappointing to discover this for the recent ESPNU airing of our dramatic 2007 win over Duke with several 3-4 minute segments of game time skipped. So don't throw out your old live recordings. There a veritable UVa vs. UNC-CHeat MBB replay marathon on ESPNU starting tomorrow (Monday) 2/11/2019 at 9:30 AM ET all the way up to our 7:00 PM ET game at UNC-CHeat.